The Future of Stretch Film! Protect products sensitive to static electricity! Hand Stretch Film Price Breaks Begin at 5 Cases! Shop clear, colored, and netted hand stretch film. 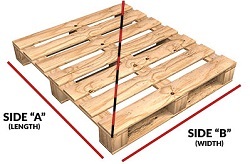 Free shipping on pallet orders! What is Hand Stretch FIlm? Hand stretch film is considered any stretch film roll that is easily applied by hand. Most hand stretch film rolls weigh less than ten pounds. Hand rolls can come in a variety of widths, but the most common widths are 15 and 18 inch wide rolls. Hand stretch rolls can be applied with or without a stretch film dispenser. The dispensers often have a braking system to help obtain a thighter stretch when applying the film. Our hand pallet wrap comes with a standard 3 inch core size allowing rolls to easily fit any dispensers. View the different hand stretch wraps to choose from below. This is a standard gauged stretch film that is comparable to any other brand of true gauged stretch film. It is made with a cast extrusion process that uses rollers to cool the film as it is extruded. This enables a faster extrusion process than blown extrusion, therefore making a more affordable stretch film. Our hand stretch wrap offers great stretch, strength, and clarity for a variety of applications. Our micron stretch film is what we refer to as an equivalent stretch film. Many experts predict a shift in the stretch film industry to equivalent films. They are produced from a different formula than the standard gauged film. This formula allows the equivalent film to be thinner, stronger, and stiffer than standard gauged stretch film. Many companies welcome the idea of lowering overall stretch costs. We recommend too try a sample if you have never tried an equivalent hand stretch wrap. This will allow you to make an accurate assessment of the film and if it is right for your needs. Pre stretched hand stretch film is a great option to consider. Pre-stretched film is a standard 80 gauge stretch film stretched to within 10% of its maximum stretch potential. This enables less energy exertion when applying the wrap. Instead of pulling hard to reach maximum stretch potential, only a tenth of the energy is required to apply the film. Some drawbacks of pre-stretched film includes decrease in cling, and decrease in ability to tightly pull product boxes on loads together. Because the film is already within 10% of its maximum stretch potential, you cannot wrap the film to tight. We recommend pre-stretched hand stretch wrap for lighter loads, or loads that will not be experiencing high transportation stress. Colored hand pallet wrap comes in a variety of colors to help color code or easily identify pallet loads. Our color tinted stretch wrap is a tinted film that can be seen through. We also offer opaque stretch wrap in white and black that cannot be seen through after a couple of revolutions around the load. Great for protection and concealment of loads. We offer a variety of stretch film dispensers to assist in applying your stretch film. Our standard gauged stretch film offers up to a 300% stretch rate. The ability to have a braking system when applying the film is important to eliminate waste. Click the link for stretch film technical data, or call our toll free number at 1-800-441-5090 with questions or quote requests.